Last week I took advantage of quick sketchers Martha and Cathy being away to spend an hour working on one image instead of constantly moving from one spot to the next. This was a really complex scene and the more I drew the more details appeared to draw. By the time I finished, Sonia (who did several sketches of different views from the same spot) and I were so cold we decided to head home. I work right across the street from the lake and doing this drawing helped me to see what an amazing resource I have for sketching right outside my door. The next day at lunch, instead of eating in the kitchen with my colleagues, I took my sketchbook and went for a walk by the lake. My plan was to sketchercize: walk for 15 minutes, do a sketch, and walk 15 minutes back, getting in a 30 minute walk. But 5 minutes from the office I saw a row of Double-Crested Cormorants all lined up drying their wings in the sun as if they were on clotheslines. After I sketched a cormorant and walked a few minutes more, a gaggle of goofy geese were all lined up at the edge of the sidewalk, waiting for someone to decide what to do next, and they needed sketching. Walking back to the office I came across a foot-high rock with a bronze plaque on it that said “Leon Olsen loved to walk here.” What a great way to honor someone. A memorial walk rock! I am so impressed with your patience on the top sketch – and you didn’t get lost in all that detail. It looks great! 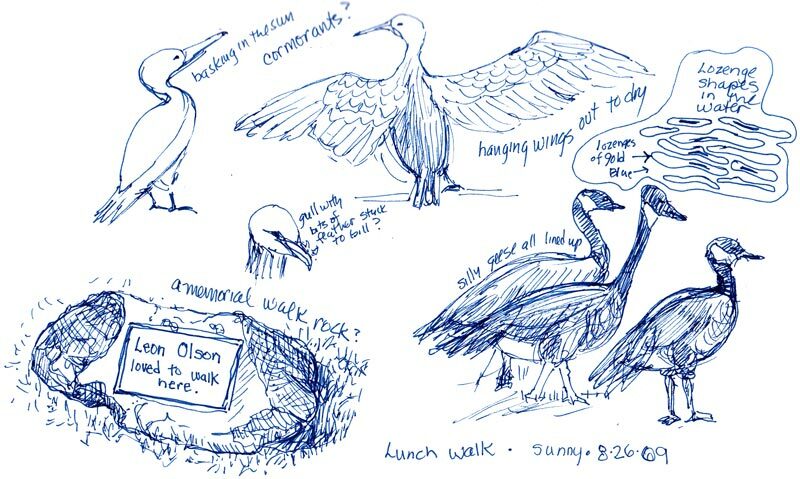 I love the bird sketches, too – what a great way to use your lunch break! Jana: I agree with you–how nice of someone to memorialize Leon Olson with the notation that he enjoyed walking along the lake right there. Reminds me of a little doggie statue (about 1-1/2 feet high) next to a marker in the cemetery where my parents are buried. You KNOW that person really loved his dog…and that’s a good thing! You are so awesome. These are wonderful, and so inspiring! That first one is a masterpiece! I am definitely getting sketching materials as soon as I get home. You make the sketches come alive with the commentary too! Those geese needed sketching, no doubt. And I am so happy to know WHY the cormorants do that with their wings! Also, how wonderful, is a lake to enjoy and study outside your work. Bravo for the sketchercize attempt and thanks for sharing birds and Leon’s walk memorial. I like your copic sepia and have it on my winter list to Buy & Try. 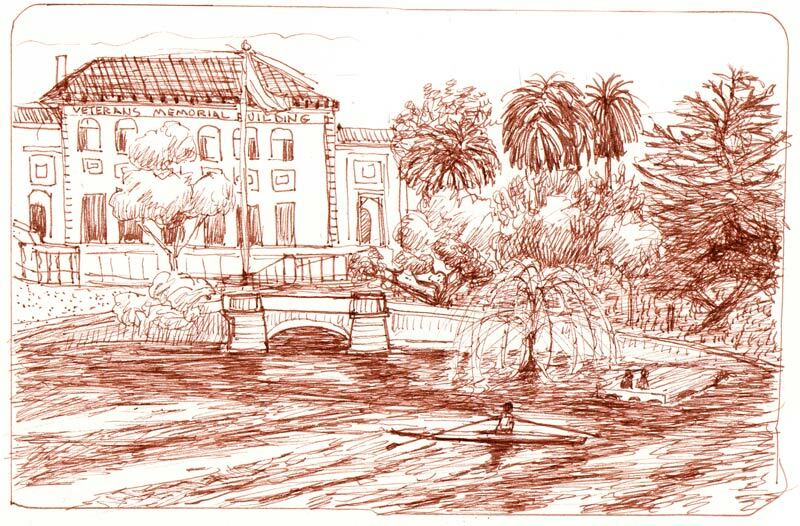 I miss visiting Lake Merritt (I used to live in Oakland years ago). Your sketch brought it all back. I wish I could go to Children’s Fairyland and sketch but I don’t have access to a kid (required for park admission). Anyone have one I could borrow? LOL! Sounds like a good opportunity for a telescopic view of the park from your office window! I wonder if a group of artists would be considered a “field trip” or “party” to Children’s Fairyland? That new Aesop’s Theatre must be the recent renovation they have for rental events. I suppose if they can rent for a wedding – they should be able to make provisons for artists??? I’m thinking if I can’t get into Fairyland to paint – December might be a good month to go down to Alameda when Santa is on Thompson St and paint those crazy decorations! It’s a busy drawing but delightful. Staying with the one colour is a good idea. Yes, there are things to ‘draw’ our attention ever so close, details and shapes and textures everywhere. I am not ‘drawn’ to dumpsters but certainly to recycling, and odd things lumped together, graffiti in lanes with posh cafes, etc.